There are a lot of great reasons to make your own soda syrup. You can use real sugar, rather than the HFCS devil that lurks in most bottles. You can make flavors that make you happy, from real seasonal ingredients with complexity and intensity, and you can use up excesses of things in your fridge like, say, the time you assumed strawberries being on sale meant that you were going to eat a few pounds of them before they went bad. You can use the syrup as a foundation for cocktails, because it’s Friday and baby, you’ve earned it, and you can package bottles up as gifts for friends, because you’re just that awesome of a person. And while every one of these crossed my mind when I made this syrup this week (uh, once my kitchen and bathroom were reassembled), I am not sure any of them are the truth. The truth is not practical, logical or even terribly grown-up; it will never make it into a longform think piece about food and culture, thank heavens: I just wanted something pink, tart and pretty in my life, something that fills your kitchen with the smell of cotton candy, sunshine and popsicles as it simmers away on the stove. I wanted spring, and seeing as the weather was not going to provide it for me, I hoped a weeklong dose of ombré green and fuchsia would suffice. Phew, it’s a good thing none of you thought I was punk rock, because clearly, this post is as twee as anything. Fortunately, there’s a bit of substance beneath the fluff. This syrup tastes intensely like fragrant strawberries and tart rhubarb, laced with a hint of lemon, and it’s miles better than anything I have ordered for $8 from my nearest bespoke restaurant’s mocktail menu. It’s incredibly practical too; the pulp leftover from straining the syrup makes a fantastic stir-in to your morning oatmeal, yogurt or even dolloped on top of this weekend’s oatmeal pancakes. But, you know, you can also make it because it’s a brilliant ray of spring — I did not touch the saturation dial on these photos — and there are worse things than opening up your fridge after a long day and finding a hot pink bottle of fizzy refreshment waiting for you. 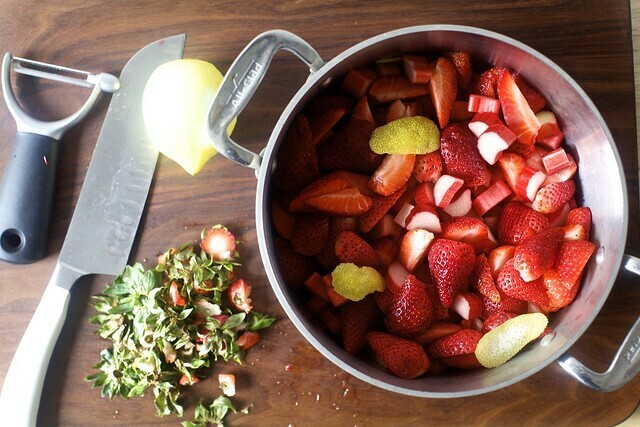 Combine strawberries, rhubarb, sugar and water in a large saucepan. Remove several strips of peel from lemon with a knife or peeler and add them to the pot. Bring mixture to a boil and then reduce it to a gentle simmer. 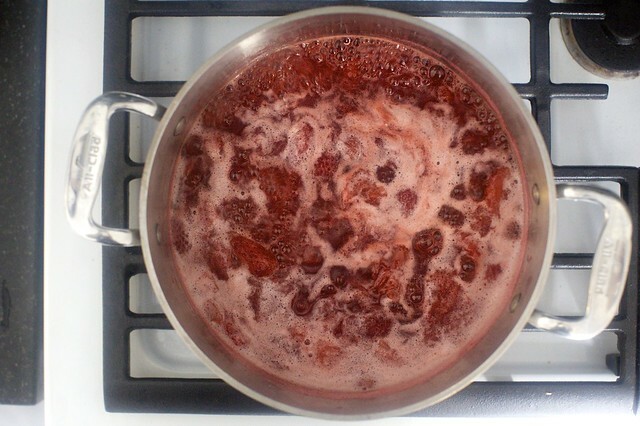 Simmer for 20 minutes, or until fruit has completely collapsed, stirring occasionally. Remove from heat, add the juice of half the lemon (or more, to taste) and let fruit cool in syrup for maximum infusion. Once cool, pour mixture through a fine-mesh strainer (or, if you only have a coarse one, line it with cheesecloth or a lint-free towel); press solids with the back of a spoon or spatula to get the most syrup from them. You should have 2 cups right away, but I had to run an errand, left mine sitting in the strainer and was delighted to find 3 full cups of syrup when I got back. Pour into a glass bottle and chill until needed. To make 1 glass of soda, pour 2 tablespoons of the syrup in the bottom of a glass, fill with ice and then seltzer or sparkling water. Give it a stir and add more syrup to taste; for a large glass, you might use up to 2 tablespoons more. Garnish with a lemon wedge, if you wish. Drink and pretend it’s spring. Do ahead: Syrup should keep in the fridge for at least three weeks, if not longer. You are wonderful. That is all. Bring on the pink! I’m totally crushing on this syrup and all the other girly, fluffy, cotton candy things! I’ve been waiting for rhubarb to show up at my farmer’s market. We’ve had strawberries for a month now but no rhubarb. This does it. If there’s no long red stalk of springtime at the booths on Sunday I’m stopping at Safeway on the drive home. How truly, perfectly spring, Deb. Thank your little one for all the mocktails, please! Spring has arrived with strawberries & rhubarb, love the syrup and can’t wait to be back home to make some! Where did you find rhubarb in NYC? Celine — Manhattan Fruit Exchange in Chelsea Market. I have given up on waiting for things to emerge from the earth this year! Why would you not add gin to this for a Strawberry Rhubarb Tom Collins? Or tequila for a strawberry rhubarbarita? That’s what I will be making on this Derby Day instead of a mint julep. I’m definitely not generous enough to give this away. Danielle — Absolutely. I am not positive that the yield will be the same, but I’d expect it to be close. Josh — Oh, I would in a heartbeat if I wasn’t 6 months pregnant. Please have two for me. Wow. I feel like we might be on the same page…I was just doing a tamarind soda syrup here in Belize…with soda…and it’s DELICIOUS. Tart and…yum. I LOVE the idea of rhubarb. Your site remains my favorite food site in the world. This looks amazing! Where did you get the bottle? How yummy! I bet this tastes incredible! Wow this serious syrup! I like to use in crepes and pancake topping. The tart flavours of rhubarb are well welcomed in the world of chocolate and caramel. Sometimes a girl needs a bit of fruit in her day, especially if I can use this martini. Yum! We served the Rosemary Lemon Rhubarb Spritzer (also non-alcoholic, and springy, and lovely) from Simply Recipes at our post-wedding party, and lots of other times! But never thought to do strawberry-rhubarb. Clearly I am a moron. Thank you! If you’re an impatient person (…asking for a friend), could you zest the lemon peel before adding it? This looks absolutely amazing! I’ve been making some super lazy spritzers lately (just add whatever chopped fruit to flavored seltzer, then eat fruit later), but this looks like something I might have to try! This sounds delicious! I’m hosting my sister’s bridal shower in a couple of weeks and I am planning on making your rhubarb snacking cake and strawberry cupcakes. This would go so well with the menu! Do you have any suggestions about how to make this an alcoholic drink? What about prosecco? I literally just made a strawberry syrup two days ago based on your strawberry, lime, and black pepper popsicle recipe because I also had leftover sale strawberries. I cooked with rhubarb and strawberry for the first time this week (made a strawberry and rhubarb compote) and was amazed at the flavor; how something so tart turned into something so sweet and flavorful! I thought how good it would be as a syrup over a cake or ice cream, but a soda…or a take on a margarita? sounds even better. yum! Looks great – so pretty!!! I think my rhubarb-loving husband will probably fall for it!!! You mention that it should keep for at least three weeks in the fridge. How would I know if it had “run its course”? Thanks!!! This looks SO good! We were just talking about making cocktails tonight and adding this syrup will be just the thing! It’s perfectly cocktail worthy and pretty color too! This sounds so refreshing! So many possibilities from responders, too. With gin! over pancakes! in a Margarita! or swirled in prosecco! Ok, gotta run to the store now. Allison — I think this would be great with a nice dry prosecco. I also like Josh’s suggestion (#8) for a strawberry-rhubarb tom collins. Amy — Wait, is that faster? I figured taking big fat peels and dropping them in was the easiest way to get the lemon vibe, plus you’re getting some white too, which I think adds a more round flavor than just the zest that a microplane would grab. Matt — My addiction to the strawberry, black pepper and lime combination has not waned in the slightest in five years. Your friendly neighborhood nag here…since there is rhubarb available to you now… what about that pie you promised us (ahem! )— last year— the one that fell on your kitchen floor?? We all have the evidence from that post, and will hold you to it. Should be a breeze, since you already tweaked it to perfection I’m sure. PLEEEEEASE Deb, may we have that one too, the pink color and tangy taste will hit the spot, just as the syrup does, but it will fill tummies too…like MINE for instance. I’ve NEVER shared pie well. Okay, so I’m one of the apparently few who doesn’t want strawberries sullying my rhubarb… would you recommend increasing the sugar if I use just rhubarb (and don’t want it to be unpleasantly tart)? Looks nice and refreshing for the summer! And on a recipe note, few thick slices of ginger would also be fantastic in this. My co-workers and I decided a couple years ago that, if we opened a bar, our signature cocktail would be based around my strawberry rhubarb lemonade. Deciding what that cocktail would comprise has been pretty fun. We’ve tried it with rum, with tequila and with moscato. All absolutely drinkable. I too went bonkers with strawberries because they were on sale. THREE DOLLARS OFF organic strawberries? How could I refuse? I don’t know but I wish I’d tried harder because truthfully it’s no difficulty for me to down a box in a night. LOVE. read this, picked rhubarb, made it, am drinking it right now. thank you for another lovely recipe. next book on the horizon??? Could you add the pulp to home made ice cream before spinning it in the ice cream maker? or add it just before it is done? Maybe this is shocking, but I always add a pinch of salt in anything rhubarb to counteract the bitterness. id imagine the extreme acidity and sugar would prevent any of the actual salt from distracting from the taste. Thanks for such a great inspiration! I made syrup with all the leftover fruit that has been sitting in my freezer all winter. Currents, blueberries, strawberries. I like my drinks a little chunky so I just used the hand mixer to mix up the syrup and left the fruit in. It’s perfect with a splash of gin! What do I do with the halved, removed stems? Otherwise sounds awesome! Can’t wait! This sounds delicious. I’m especially excited with the cocktail direction it can take. It seems like vodka’s future best friend. It’s begging for booze. This looks gorgeous. Too bad I’m allergic to strawberries and not terribly fond of rhubarb. Somebody have an extra one for me! Love this great idea! Could I use the blackberries and loganberries that have lingered in my freezer since last year? What a fantastic idea! And it’s gorgeous, as well. I love it when Mother Nature provides beautiful colors for us. You can make just about anything into a syrup – what we Australians would more likely call ‘cordial’. I do cherry in summer and lilly-pilly in autumn. I can recommend an excellent book called ‘A Year in a Bottle’ by Sally Wise if the whole preserving thing is appealing. I enjoy the blog very much – first time commenter though. Thank you! This was the perfect post to come to after the work week. I picked up the ingredients while out getting pizza and beer for dinner-ha! I’m eating the pulp in my yogurt this morning and it is even better than I imagined. Keep the wonderful surprises coming! Oh my this sounds like a perfect spring to summer treat. 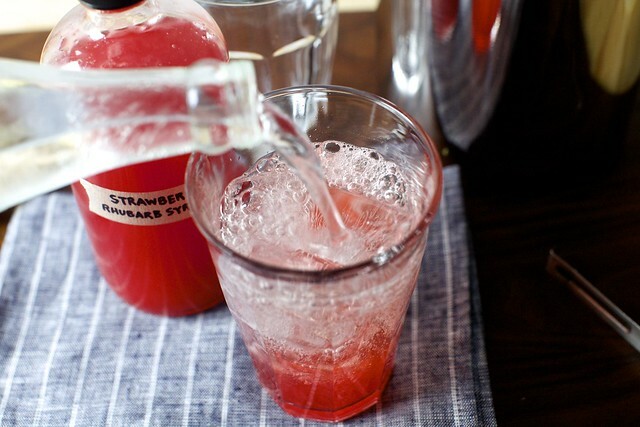 I must try making this strawberry rhubarb soda syrup. Your photos are amazing! Thanks for sharing, Deb. 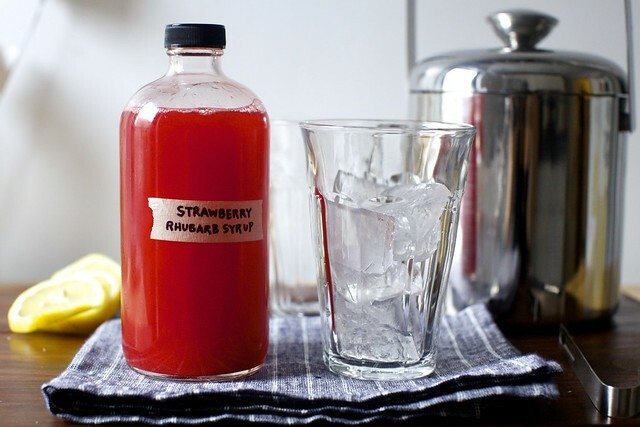 I made rhubarb syrup over and over last spring … makes KILLER margaritas. I made this today – in the interest of science I used a stab mixer once all was cooked and cooled a little – I have gotten approximately 4 cups yield for each lb of fruit – was a little panicked it would produce a murky syrup but used cheesecloth and it was good to go, nice and bright and clear. Love the lemon in this. Thanks for another great post and recipie Deb! I just looooove the looks of this! Yum! Deb, if you’re in the mood for strawberries, you MUST try the strawberry balsamic pie from the Four and Twenty Blackbirds cookbook. It’s insane… it might be the singularly best pie I’ve ever eaten. I’m already trying to figure out a socially responsible reason to make this again (and not, you know, stand in my kitchen in my underwear eating spoonfuls from the tin). I don’t buy soda for that exact reason: HFCS and it’s harmful effects on the body. I have scared my boys (that includes hubby) silly about it’s harmful effects, but this “soda” is one I (we) have got to try! The idea of a strawberry rhubarb soda with a scoop of coconut ice cream makes my heart pitter patter. YUM. Now how about a side of onion rings with that? And for that strawberry-rhubarb pie, perfected, so ahead and read Cook’s Illustrated May&June 2015 magazine, pages 20 and 21. I am so taken by their recipes they should hire me for PR. I just love Springtime when produce like strawberries and rhubarb makes me remember why I love living in CA so much! I’d like to see your syrup drizzled over some crepes for breakfast. Yum! Enjoy Spring, Deb! 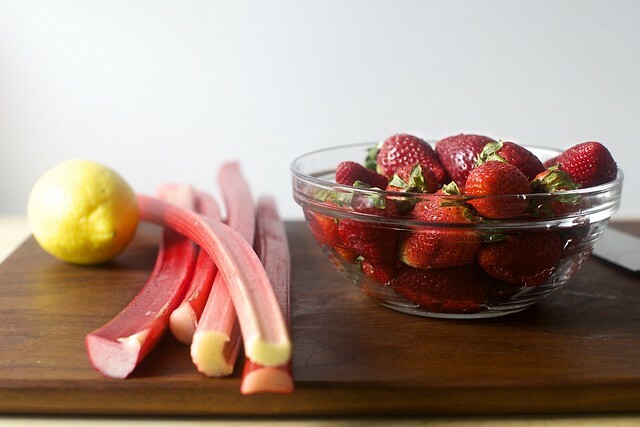 Now, if I only lived somewhere that rhubarb and strawberries were available locally at the same time – usually our rhubarb is well gone by the time the strawberries really roll in – think I can get away with recently frozen ‘barb? I’ve never made my own soda before but it looks good! I’ve been seeing tempting strawberries in Paris market stalls for the last week. Absolutely dying to try this recipe! Being that it’s spring, and that I’m from Vermont, I subbed maple syrup (just boiled up the hill from me), for the sugar. Can you say “yumm!”? It adds even more depth to the strawberry-rhubarb,earthy, spring-fresh deliciousness. Any idea if this will work if I substitute splenda for the sugar? Not ideal, but necessary to make this even possible. And it sounds so good! For lazy cooks (like me) use frozen strawberries. Also added a dash of cardamom. Made this so the teenager who does theatre could take a healthier soda! I have now taken the leftover fruit sludge to make a pecan strawberry rhubarb teacake – less fat, more fruit!. I am a little worried about the colour, but I am sure the taste and texture will be fabulous. Maybe pink food for a wedding/baby shower?????? All this rhubarb reminds me of being a kid! Oh this is perfectly pink! Love it! And I was just thinking about how I needed to make some soda syrups for a party. Thanks! Think you could freeze the syrup into ice cubes? Seems like throwing a cube or two into a vodka soda could be the perfect lazy girl cocktail. Love this! I have allergies/sensitives to a lot of food additives so I’m always looking for new ideas for homemade food. I haven’t tried making my own soda yet but this looks pretty easy :) Although, where I live I usually only see fresh rhubarb in early spring but one of the grocery stores carries it frozen. Would that work just as well as fresh? I made a honey-pineapple syrup with crushed pink peppercorns that was FANTASTIC. Makes a great base for cocktails (I use it in a mezcal drink), but it’s also great for a soda. I stole Josh’s idea about the strawberry rhubarb Tom Collins. Excellent. I’m going to make a big batch of this, divide it into 1 cup servings and stash them in the freezer so we can enjoy them all summer long. Thanks for the great idea. Kristen — Sounds delicious to me (and thanks for the idea!). monica — Sorry if that’s confusing; you remove the stems and halve the strawberries themselves. Jamie — Definitely. You’ll probably only need a little more sugar, however, you might have less of a yield — I’m not positive how much of the liquid comes from strawberries and how much from the rhubarb. Deb- Wow. A recipe after my own heart! I felt like this was written just for me and would be a great inaugural rhubarb recipe for 2015. I made this Sunday and WOW!! I am no stranger to all things rhubarb and strawberry rhubarb, but had never made syrup. Such a quick and easy process!! I admit, I was leery of the lemon, but tried it anyway, as you wouldn’t lead me astray. I am forever converted. The lemon is what has been missing from all of my recipes. We used the fruit for pancakes and made sodas later in the day. Truly incredible. Something so simple is so complex and delicious and is really a ‘two-for’ recipe. THANK YOU for elevating something I thought I knew so well to a whole new level!! I made rhubarb just for straight eating a couple weeks ago, and used the leftover syrup for yummy drinks all weekend. I serve a large family, and so I think more in terms of “by the bottle” than “by the glass”. Mocktails are perfect for us! Do you think I could pour off a bit of the seltzer from the bottle, and replace with the syrup? Would it flatten itself? Which seltzer water, or that type of thing do you buy; forgive my ignorance. And for the grown ups, did you answer the prosecco question above? Have you tried this as the base for a sangria? Would there be an alternative to using the lemon? I can’t eat any citrus fruits without severe regret! Jennifer — We actually have a Soda Stream, so that’s what we use for seltzer. However, our canisters were out of gas when I made this so I grabbed a couple glass bottles of Boylan, which are expensive but seriously delicious. NYCJennifer — It’s sour and firm when raw, but it tastes wonderful when cooked until soft and sweetened. Jean — Just skip the lemon. It’s complementary here, but not the core flavor. I ordered bottles from Specialty Bottle after seeing them here. They just arrived and they are way prettier in real life than they looked online. I am making vanilla for family Christmas presents and they will be gorgeous. It is already brewing so come fall it will be amazing. I may order more for syrups. Thanks for the terrific recipe. We’re almost through the first bottle, and my husband and daughter collaborated on a cocktail they named the Rainy Day Remedy: 1 1/2 oz strawberry-rhubarb syrup, 1 1/2 oz gin (they used Aviation), 3 drops Fee Brothers Bitters, and 2-3 oz ginger aie. Served with an orange peel twist in an old fashioned glass. I think the pulp would be great in a hand pie. I hope to throw together a simple doughh for the next batch. My rhubarb is a few short weeks away from harvest! I’m thinking of topping this beverage off with some ginger beer. Made the syrup last night. Easy as (forgive me) pie. Gorgeous color. I made this the day after you e-mailed the recipe. The syrup is absolutely delicious (I added the juice of a whole lemon). However, even better is the left over pulp. The large pieces of lemon zest actually melted into the pulp, so I didn’t need to remove it, and it gave a bright note to the pulp. I used your suggestion to fold a few spoonfuls of the pulp into plain Greek yogurt and topped with sliced almonds. My new favorite breakfast!! I got a Soda Stream for Christmas and I can’t WAIT for fresh fruits to be in season here so I can make all kinds of soda syrups. Sadly, my rhubarb is only about 2 inches tall so far and all leaves–no stalks yet. But it’s coming! Can I just thank you or making me look so impressive at my girls night? Vodka sodas tinted pink due to the delish s-berry rhubard syrup. 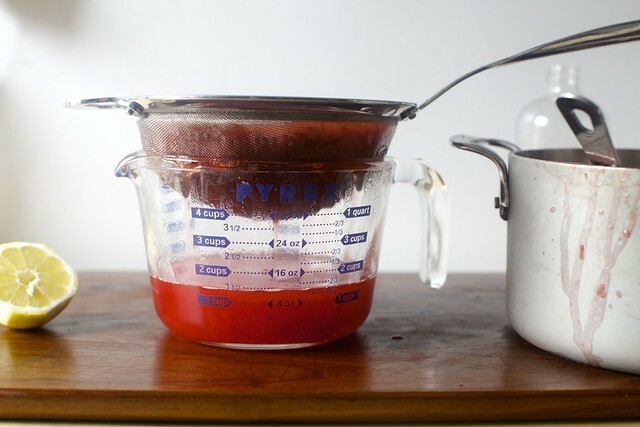 I have used cooked-to-mush and drained rhubarb pulp instead of applesauce in low-fat breakfast muffins and it is delicious; I reckons the remains from this syrup would do the job nicely too (maybe adjusting for sweetness; how sweet is the pulp?). I’ve never eaten rhubarb but this looked so happy I just had to try it. I am so glad I did. I am taking it to share with my daughter in law who just came home after having a baby and is still taking things easy. What a treat for after lunch, and I got to eat the pulp topped with vanilla yogurt for a nice dinner. Thanks, Deb! I didn’t have rhubarb, so I made this with 1.5 cups of strawberries, juice of half a lime, half a lemon, 1/2 cup water and 1 tsp honey. Absolutely delightful! I will add mint next time as the syrup cools for a hit of extra flavor – have some chocolate mint from the farmers market that is fantastic with strawberries. Off to drink more water! Thank you Deb! Made it. Loved it. As always. I used frozen strawberries and rhubarb from last summer and then made it again with some frozen peaches as well. The leftover pulp is also awesome – we have been mixing it into the batter for our baked oatmeal. Made this with just strawberries – 2 lbs. It was WONDERFUL! I made this today and it is absolutely delicious. I’m really happy to have this in my fridge! Next time I’ll save part of it in a sterilized bottle to see how long it will keep, because I think this would make a great gift. This time I thought it wasn’t worth the bother, as I’m pretty sure I will drink it all before it goes bad! Has anyone tried this with the green rhubarb stalks? I don’t have the red variant, but I have a huge harvest of my green stalks this year. I am always nervous about the color. Your recipe includes HFCS. The chemical ingredients of HFCS are 50% fructose and 50% sucrose. The ingredients of granulated sugar are 50% fructose and 50% sucrose. They’re the same thing. It’s still a great recipe, but it’s not as healthy as you’re trying to make it seem. Dana — I’m not a chemist and thus may have interpreted this completely incorrectly and would appreciate any corrections, but I understand sucrose (table or granulated sugar) to be evenly split between fructose and glucose, and the HFCS variety most commonly used in sodas to be 55% fructose and 42% glucose, and it’s this higher proportion of fructose that gives is the “high fructose” name. They’re also bonded differently; in HFCS, the glucose/fructose are unbonded and in sucrose, they’re bonded. Our bodies break them down the same, however. The goal of this recipe was not solely to avoid HFCS, though, which is easy enough to these days as just a few brands still use it. It was to make a delicious strawberry-rhubarb soda that you could control the sweetness of at home; I’ve never found anything close to the flavor in this from a packaged brand. Again, I’m not in a panic about HFCS and have never been; the excess of sugar and garbage flavorings in packaged sodas is what I prefer to avoid. Here, you can control it and with a much more intense flavor from whole ingredients. Wondering if anyone else had this issue – the fruit became super-duper thick after cooking. It’s been straining for 2 days and has only produced about a cup of really thick syrup. I made a similar recipe without the strawberries and it didn’t have this problem. Could it be that strawberries have more pectin and I inadvertently made jam?? Deb – my kitchen scale is broken. (First world probz). About how many cups is a pound each of the fruit? Sarah — I didn’t measure the volume but from Googling, I’ve seen 3 3/4 to 4 cups as an estimate for 1 pound strawberries, and 3 cups for 1 pound rhubarb. I made this recently and the syrup was delicious! However, as soon as I added the sparking water from my Soda Stream, everything fizzed up terribly and the water lost a lot of its carbonation. Did anyone else experience this? Deb, any insight here? Anna — We have a SodaStream and I’ve never had that issue with this. The only thing I find quickly flattens this and pretty much all fizzy drinks is plastic cups. I’m pretty sure we put in syrup, then soda, but you might try it the other way around and see if helps. Hi – I made the syrup this morning with fresh-from-the-farmer’s market rhubarb and strawberries. We didn’t have any sparkling water and it was divine with water from the Brita filter. Thanks! I made this recently and every time I open the fridge and see that stunning color, it makes me smile. It’s also a fantastic flavor combo and I really appreciate being able to adjust the sweetness level to personal preference. I made this last week (it’s amazing!) and am just not in love with the leftover mush stirred into yogurt, so I’m thinking about turning it into a quick bread. Anyone have suggestions before I forge semi-blindly ahead? I’ve also just discovered that putting the syrup in my Zoku popsicle maker makes the most delicious popsicles. Maro — It might be good to look at a banana bread or applesauce loaf for guidance; the fruit mush it likely to sub well for bananas or applesauce. Here’s my favorite banana bread, for reference, and here’s an applesauce cake we adore. 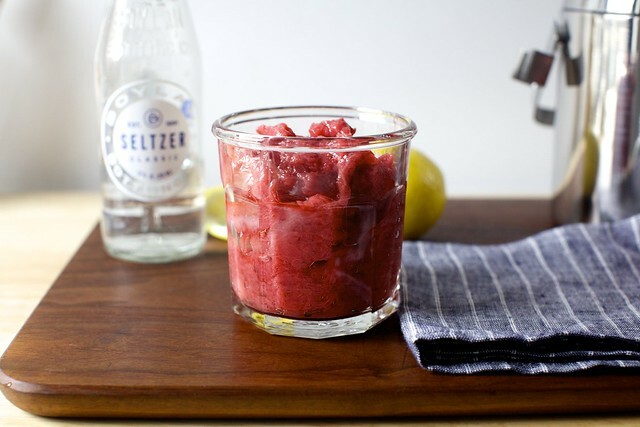 You can adjust the flavorings to things you’d prefer with strawberries and rhubarb. thanks, Deb! banana was going to be my default, since it’s the only fruit bread/quick bread I’ve made before, but applesauce is a great suggestion, too. I plan to load it up with cardamom — strawberry-rhubarb-cardamom is a recent flavor addiction since my sister-out-law sent us jam of that combo. heaven. Strawberry-Rhubarb-Ginger-Cardamom! It took almost an hour and still seemed a bit under-proofed — maybe i needed a slightly higher temp? It got tall and then fell, so it may have had to do with checking in on it too much. But so delicious, no one seems to care. Based it off the applesauce cake recipe, just subbed out the spices: 3 tsp cardamom (some freshly ground), 1/2 tsp dry ginger, few grates fresh ginger, 2 tbsp dark rum, about 13 oz mush. Took about an hour in my large loaf pan. Lindsey – it’s not just you. I’ve made it twice now and only gotten half of the expected liquid output. :( I did try the stick blender per a previous comment and that didn’t help much, just made my mush mushier. Still a beautiful recipe but I’d love to know what I’m doing wrong. Lindsey, Kalle — I suppose the only logical answer is that our fruits had different water levels. Were they very soft once cooked? I aimed for a longish simmering time to ensure they’d be able to release as much liquid as possible. That said, if your fruit did have less water in it, the syrup might just have more of a concentrated taste, and therefore you might need less to make a nice glass of soda. Are you finding that? Just made this yummy syrup after a trip to Union Square greenmarket this morning. Couldn’t wait to try the recipe. Thanks. Like your bottle, too. Did you happen to get it from Specialty Bottles? Thanks again. Hi Sue — Yes, Specialty Bottles all the way! Um, I’m sure you already know this, but leftover pulp + plain yogurt + popsicle maker = AWESOME. Here’s a recipe for the leftover pulp: Freeze it, thaw slightly, then blend in a high-powered blender with 6 oz tequila, juice of 2 limes, an additional handful of ice, and 2/3 C. water or coconut milk (the stuff in a carton will add creaminess but no coconut flavor.) Additional simple syrup optional. This comes out like a fruity frozen margarita. Delicious! I made this a week ago… and drank all of it myself in a matter of days. Thank you so much! oh wow, yum! love it! I didnt measure the fruit, so I think I have more syrup and a thicker syrup… it’s still draining but we had some with lunch and it was really refreshing. Thanks! Reporting back to say: I have succesfully kept this for 3.5 months in a sterilized bottle before opening, so feel free to make a big batch and keep it like that. omg, this is awesome!!! I do my own canning and I save the leftover syrup. Thanks for the ideas to use them for!! I can them with the fruit and they will last unopened for a year or more. Thank you!! Just made this. It bubbled on the stove while I fed screaming 3 year old twins and a cranky 10 month old. Dumped it into a strainer while I took care of the kids, and presto! Syrup. Quick, easy and delicious. And you’d better believe I’ll be adding a little something ‘extra’ to mine! I’ve never used this method before and have failed several times at the self-carbonating style of homemade ginger ale, so I was skeptical. True to form, however, your instructions are _spot_on_ and the outcomes extremely reliable. I will never buy soda again! You have (not just with this recipe, but many, many others) transformed my culinary practice! I’m not overstating to say that I use at least one of your recipes per week! Thank-you so much for sharing with the rest of us! I love your comment feed. It’s an added bonus to all the already wonderfulness of your site, and you commented, possibly for this recipe, about trying the leftover rhubarb that had been cooked down in your jacked-up banana bread recipe. I did it and it was awesome! I didn’t have the bourbon on hand (for shame! ), and even used a GF flour blend (ugh), and it was wonderful. It freezes well too. This rhubarb sauce is definitely the best too. I just tried one from NY Times (which is how my rhubarb leftover came to be), and I will be, sadly, not excited to use the syrup. We love this! I just froze some strawberries and rhubarb to make it when my sister visits in July. The leftover mash is nice for little pastry cookies. I am thinking of trying it in rugelach. Mine does not come so dark as yours. It is also not thick, as some others are saying. It is almost a think juice – like oj with some pulp. I do cook it a long time (perhaps too long?) I then push it through a mesh strainer with the back of a ladle. I have never had less than three cups of syrup. Do you think I making a trade of more quantity for less potency? When I made my first batch this year, I cut up the strawberries and rhubarb, added the sugar, and covered them overnight in the fridge. I did it to save time the next day when I planned on cooking it. It helped break down the ingredients, but I think I would leave out the water next time I do that. This batch came particularly light and I think the liquid from the overnight fruit/sugar mixture would have served in place of the water. Any thoughts? – Add equal parts (!) tequila for a yummy rhubarbarita, including a salted/sugared rim as you prefer. – Mix with lemonade and a few shots of vodka for a lighter, yet refreshing, cooler. For this, I personally find store-bought lemonade much too sugary, so homemade is preferred so you can monitor how much sugar you add – the more tart the better so it offsets the sweetness of the syrup. Absolutely fabulous!! Made it last night and it is still straining; did I cook it too long?? I am enjoying some on my yogurt as we speak; yummy!! Love this syrup! I made it yesterday evening and used the fruit pulp as the filling for strawberry-rhubarb handpies. They were delicious!! So I don’t do oatmeal much, but I ran the leftover pulp through my food processor and I tried to mix it into the dough for the crumble from the strawberries and cream with graham crumble recipe to make a sort of reverse crumble. It didn’t really become a crumble, but I did bake it into slightly sweet crostini. I would love to try that again. Wow, this is an amazing recipe. The fruit stuff was amazing on your overnight waffles (which worked fine for me in a Belgian waffle iron, btw), and the syrup was a big hit with kids (syrup ice seltzer) and adults (syrup, lime, seltzer, tequila) alike. Just made it again, since rhubarb is just now done in Vermont. Gonna stretch rhubarb season as long as possible. Hi Deb! Any suggestions for how you would use this in a cocktail? Thanks! I’d use it with vodka or white rum, plus a splash of fizz. Hi deb, I didn’t get nearly two cups but the fruit had definitely collapsed. Any ideas on where I went wrong? I added the cup of water and used a pound of each! What do you mean by collapsed? I might have missed something. I just made a double batch of this using local PA strawberries and rhubarb from my farm share (swapped turnips for more rhubarb). I froze the rhubarb waiting for the strawberries to hit the markets. The house smells heavenly and even unstrained it’s delicious! Whoa! I just remembered there’s vanilla ice cream in the freezer! Dessert! Thanks!! My family LOVES this recipe, we call it ‘Magic Elixer’ and use it exclusively for gin or vodka tonics! This is so delicious. It produces a lovely, delicately flavored soda, and the syrup is also amazing on vanilla ice cream. I blended up the leftover fruit (including lemon peel) until smooth and layered it with whipped cream and Nilla wafers for an impromptu trifle, which was a huge hit!